It has just been murderously hot in the hobby loft over the last week but I've been sneaking some hobby time up there in the early mornings and managed to get a start on the terminators - base reds, steel and golds are on! I'll be the first to admit they're not going to be the most fearsome unit of terminators ever, as they're all armed with power weapons and combi-bolters, but comparatively speaking they are a cheap unit. They'll be used solely to fight infantry and take and hold objectives. I'm thinking that the way the weapons are modeled I can convincingly run them as power axes (or maybe even power lances). Will have to experiment with that I suppose! 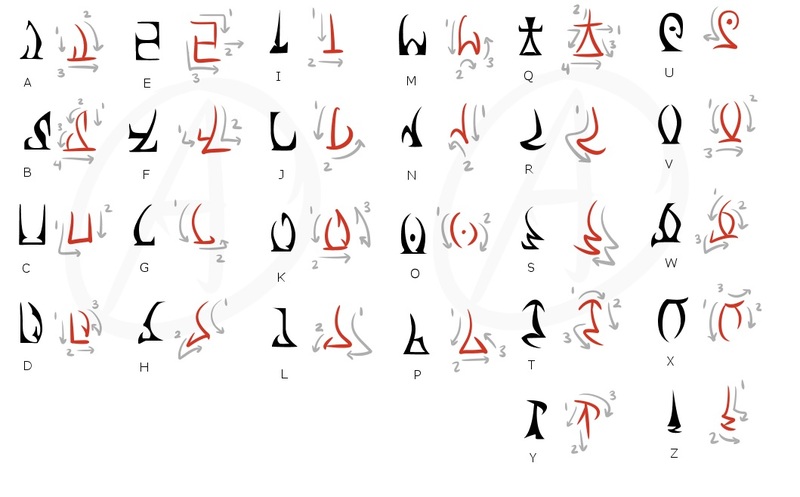 I'd gotten a couple emails about the "evil runic script" I'm using, so thought I'd post up the guide I'm working off of. Essentially it's Daedric from the Elder Scrolls games, upside down. Figured some of you may find it handy! Nothing is more evil tan upside down script! Dude, looking killer already and I'm really digging the ideas for the script. I like how the chart shows the brush stroke directions. At least what you paint will actually make sense. Far better than random made up characters with no meaning at all. Aesthetically, Power Lances kick arse btw. Love how these are looking! @The Eye of Error: Thanks! Yeah, the brush stroke thing made drawing them a snap. @Dai: Indeed! Need to get better at writing them small so I can fit in some fun secret words in. I appreciate the kind words, folks! Cheese eating surrender monkeys the lot of them!